The Fathom Desktop Connector is a small (~6MB) application that is launched from the web browser. The connector enables you to select an accounting file from the local file system or a mapped network drive and extract and securely upload financial data into Fathom. To add a new company go to 'Add a Company' and choose one of the accounting vendors. You will then be provided with the option to 'Launch the Fathom Desktop Connector'. To update an existing company go to 'Step 1 - Update Data' of the the company setup to launch the Connector. The first time you launch the connector from the web browser you are required to provide your email and password. These should be the same details used to log in to Fathom. Your password will be remembered for the next time you use the connector. Adding a new company or updating an old one uses the same process. Simply click the 'Add Files' button and select the files from your computer. You can use CTRL and SHIFT keys to select multiple files at once in the file selector dialog. The connector will indicate which files are new and which files are updating an existing company. Some files may require you to enter a specific username and password. You cannot add two companies with the same name. The Fathom Desktop Connector extracts the following information and securely uploads this information to the Fathom servers. Company details such as the name of the company, financial year and currency. In the case of an error, relevant debugging information to help resolve the issue quickly. For clarity, no personal data such as credit card information, login details, customer contact information, etc. is uploaded to the Fathom servers. It is the responsibility of the account holder to make certain that no personal data is inadvertently exposed in the chart of accounts. All data is encrypted using SSL as it is transferred to Fathom. 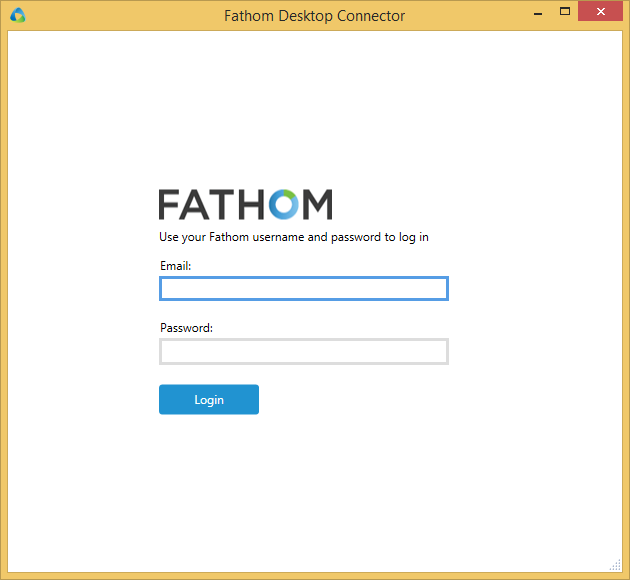 The Fathom Desktop Connector utilises Microsoft ClickOnce technology and consequently will only work on Windows XP SP3, Windows Vista SP1 or later, Windows 7 and Windows 8 or later. Macintosh OS/X is not supported. The connector can be launched from Google Chrome, Internet Explorer or Firefox. The Microsoft .NET framework v4.7.1 must be installed on your system. Most Windows installations will already have this installed however if necessary it will be automatically downloaded for you as part of the installation of the desktop connector. Answer 'Yes' or 'Run' to any prompts. Wait for the installer to download the framework. The computer may need to be restarted after the installation finishes. From time to time the connector will be updated to incorporate new features and/or improvements. This requires no user interaction. The new version will be downloaded automatically when you launch the connector.